• Large 5" glass magnifying lens. • Flex-arm lets you view objects comfortably. • Tabletop base and protective lens cover. • Comes with your choice of 3 or 5 diopter lens. 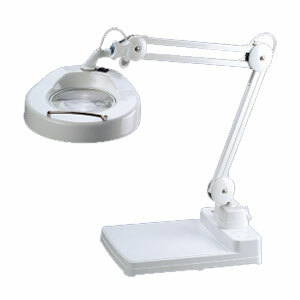 The Reizen Magnifying Lamp with its flex-arm and weighted table base is the perfect thing for reading small type or working on intricate projects. Your choice of 3 or 5 diopter glass magnifying lens is 5" diameter and comes complete with a protective cover and 22W circular fluorescent bulb.